Thank you Zondervan for partnering with me on this blog post! 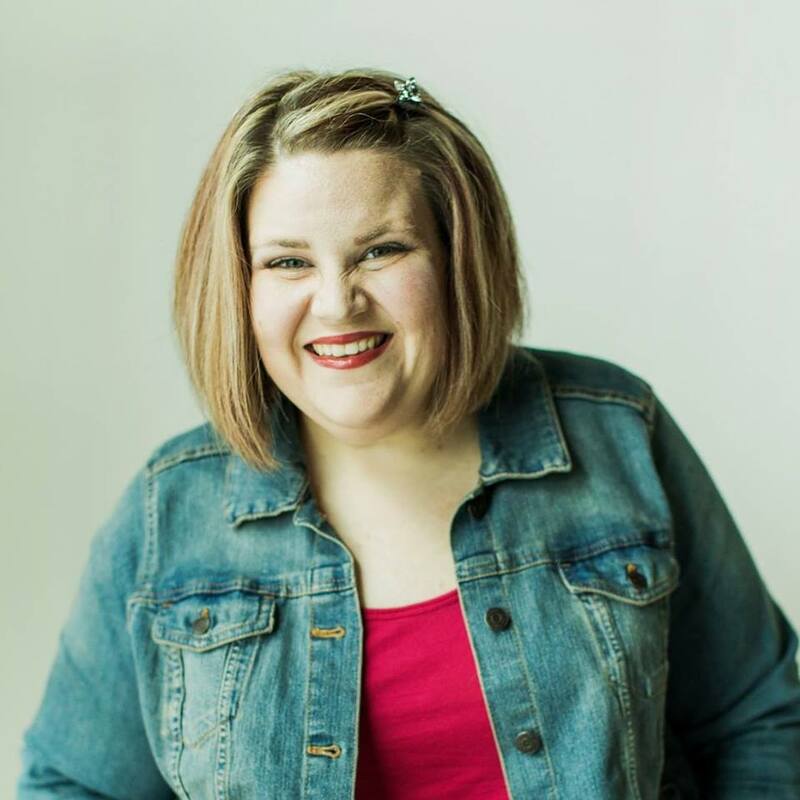 Laugh It Up with Candace Payne (Book Review)#LaughItUpBook #SimpleJoysI’m sure you’re very familiar with Candace Payne. If that name doesn’t ring a bell, than how about Chewbacca Mom? All of us saw the YouTube video in one way or another, and I bet every one of us was laughing like crazy. If not, than I’m sorry, you really need to learn to let go and to laugh it up. In the book, Candace talks about her past, her struggles and when things didn’t seem to be going very well. She learned that to get through these trials and to move on, she had to take some time to laugh! In today’s world, of constant chaos and terror, a lot of us have forgot how to just cherish the small things and to smile. We’re worried that laughing will put us in a spot where we can be taken advantage of. How do people perceive us laughing? This political correctness nonsense, in my opinion, needs to stop! We’ve forgotten how to live, are constantly worried about what others think and are afraid to just be happy where we are. No, I don’t want to climb that commercial ladder. I don’t really care how high up I am. I would much rather cherish the times with my family and friends and be able to experience joy and laughter in my life. In the end, like we always hear, will people remember you for your trials, for how high you made it up that ladder? Will they remember instead, those times of laughter, when you all had that fun time together, without a care in the world? Those are the times that I want to be remembered for! Thank you, Candace Payne, for giving me that laugh, and tears that in the end, made my face hurt and reminded me what is the most important!! I pray that your book will help many more to not take life too seriously and just enjoy each and every day! 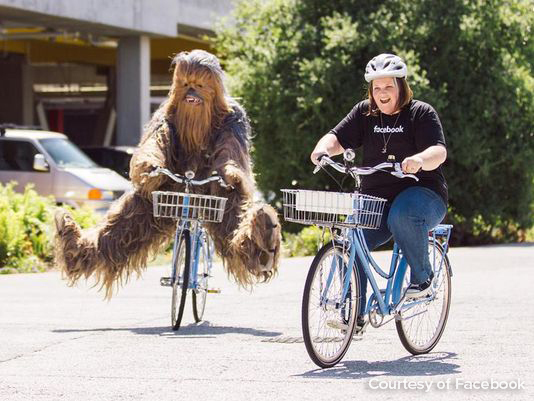 The world knows Candace Payne as “Chewbacca Mom,” the wife and mother of two from Dallas who captured the hearts of nearly 200 million people around the world with nothing but a toy Chewbacca mask, a smart phone, and infectious laughter. Candace’s viral moment of simple joy became Facebook Live’s top video. But what the video doesn’t show is Candace’s storied journey of daunting obstacles on the way to the joy-filled life—extreme poverty, past trauma, and struggles with self-worth. Laugh It Up! tells the rest of the story behind the woman in the mask. Like most of us, Candace has often felt overlooked, undervalued, and insignificant. But she has also discovered the secrets to unshakable joy that no circumstance can take away, and Laugh It Up! will help you discover and experience the same. Join Candace to discover the gift God has given us all to experience life to the fullest. All you need to do is answer “yes” when joy, whom Candace personifies as a friend, calls you to come and play. Do you feel tempted to give up on your dreams? Joy stays the course. Do your knees knock when thinking about the future? Joy hopes for what can be. Do you feel unseen and unnoticed? Joy is content whether backstage or center stage. Do you feel crushed under the weight of regret? Joy loves you enough to weep with you, but also enough to help you move on. When life punches you in the gut, it can be difficult to muster a smile—much less a laugh. But with humor and power, wit and wisdom, Candace lights the way forward to a life that is free indeed. 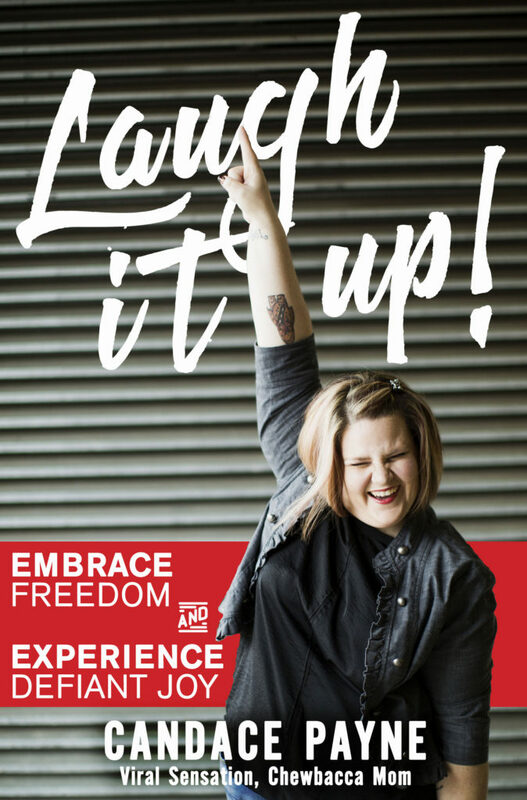 Hi, my name is Candace Payne – you might know me as “Chewbacca Mom” which is what some media outlets have called me after a Facebook Live video of me wearing a Chewbacca mask went viral (like, super viral, with 160+ million views) and made lots of people laugh. That video took me on a wild adventure and I appeared on shows like “Good Morning America,” “Entertainment Tonight,” and “The Late Late Show with James Corden,” where I got to meet JJ Abrams, y’all!! I was also invited to the headquarters of Lucasfilm (!!!) for a personal tour and to Facebook, one of the coolest places I’ve ever seen – they have an actual park on their roof! If that’s not enough, then Hasbro gave me my own “Chewbacca Mom” action figure that says phrases from the viral video. What?! In June, I shared my arrangement of Michael Jackson’s “Heal the World” on Facebook Live, which went viral too. I decided to release the song on iTunes to benefit my favorite charity, Convoy of Hope. And because of awesome people like you, the song charted in the top 30 on iTunes within the first few hours of release!! It’s still available today and continues to help make the world a better place with every purchase. If ya haven’t yet, I hope you’ll check it out. After a whirlwind year for me, my amazing stud of a hubs, our two grade-school kiddos and ornery pug, Opal…I’m super blessed to be able to share a message of living the simple joys to my friends and fans and followers around the world on the internet-webs through social media and on my TLCme video series! I would love to hear from you so please keep in touch! This book Laugh It Up sounds like it would be a great inspirational read for anyone. I would love to get it for my siblings for Christmas. Sometimes we all forget that laughter can lead to joy. Thanks for sharing this awesome book. I seriously want to read this book. It sounds wonderful. I really need to be positive and laugh more depression has pulled me down for to long. As a country we are so serious, more than ever with the terror attacks and so on. I know all well how depression is, Gladys. Do not let that take over. Like you said, this world right now is nuts!! We all just need to stop trying to be PC and make it like the days when you could talk to your neighbor, laugh and not focus on the negative. Sending hugs from AZ! Thank you for visiting my little niche in Blogosphere yesterday. It’s a delight to meet you. I enjoyed discovery of Candace’s book release and feel it has value anyone but especially those suffering the same sorts of conflicts she knows. I know finding joy in the simple things makes life rich and full. Sometimes life’s circumstances cloud our ability to see what’s in front of us to live, laugh, and breathe. Have a blessed, joy-filled day!